By some estimates, there are 25 million top-loading washers still running in this country that were built before 2003–when washing machines were markedly less efficient. Fortunately, there are more efficient models available today. Now if you’re replacing an old clothes washer, you can find one that could save you upwards of $200 each year. Here’s how those savings add up. An ENERGY STAR washing machine uses about 25 percent less energy than a non-certified model, cutting your monthly electric bill. Save even more your first year by using a $50 rebate from Efficiency Maine on any ENERGY STAR washer bought before June 30, 2019. ENERGY STAR clothes washers also use about 40 percent less water than non-certified units. That can lower bills if you pay for municipal water. And if your house relies on a well, saving roughly 3,000 gallons annually conserves water for other uses–particularly during a drought. There’s still another path to savings, particularly with front-loading washers. By extracting water in the spin cycle, they save on drying time and money. When you’re shopping for clothes washers, make sure to look for the ENERGY STAR logo—awarded to washers that go through third-party testing. Many washers have a “he” logo (for high-efficiency) to identify the most appropriate detergent, but that symbol does not signal energy savings. 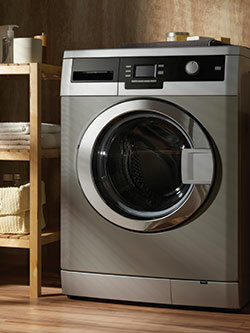 To learn more and download a clothes washer rebate form from Efficiency Maine, visit http://www.efficiencymaine.com/appliance-solutions/.